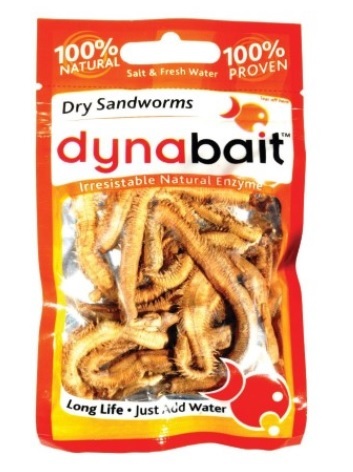 Dynabait freeze dried sandworms only need to be soaked in water for a short time and then you are ready to fish. Dynabait are marine worms (Polychaetes) farmed from a sustainable aquaculture and uniquely processed to create a high quality long last fishing bait. Simply soak in fresh or salt water (time may vary) and move to a dry container when hydrated but keep moist. When cast into the water a disbursement of Hormone and Enzyme flavour will attract any fresh or salt water fish within a reasonable distance, and generate excellent catch results. During processing all natural Hormones and Enzymes remain undamaged, keep their full flavour and result in an amazing and productive reaction from the fish. Proven catches of bream, whiting, flathead, flounder, leather jacket, mulloway, dart, morwong, blackfish, squire, trout, yellow belly just to name a few of fresh and salt water fish.